As technology enthusiasts, most of us are fascinated by the booting of operating systems on devices that the software mightn’t necessarily be familiar with. There’s a massive market for software products that facilitate, say, OS X on a PC and likewise, Windows on a Mac. Console OS, which seeks to bring a genuine Android experience to Intel-based machines, has announced its intention to bring the infrastructure to the Surface Pro line-up, including the Surface Pro 3. Android is ubiquitous in mobile space, but whilst the likes of BlueStacks and several others have brought Google’s platform to the bigger screen, the work is still very much in progress. 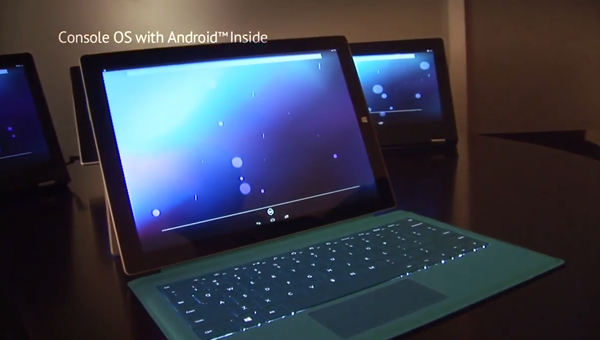 The Android-based Console OS, which would bring an Android experience to ordinary Windows devices, is perhaps the most encouraging thing we’ve seen to date, but this news that Surface Pro tablets will be supported gives the Console OS team’s Kickstarter campaign a little added gusto. There’s no doubt that Microsoft has struggled in tablet space as it has in the smartphone arena, and while recent reports have suggested that the Redmond giant is considering the idea of an Android-based Lumia handset in the future, Console OS’s effort to bring Android to the Surface Pro family would doubtlessly increase the appeal of the software maker’s tablet roster. The Kickstarter campaign for Console OS began a few weeks back, and with over one month to go, has amassed $41,000 of the $50,000 target. But because it now wants to push the boundaries and bring support for the Surface Pro range – including the Surface Pro 3 – the team behind the effort has decided to up the total goal to $125,000. There are several obstacles that will need to be overcome if Surface Pro support is to be forthcoming, and so Mobile Media Ventures – the group behind this ambitious endeavor – hope that by making this announcement today, enough backers will be willing to pledge some money to the cause and throw their support behind it. The key thing to remember here, is that Console OS should bring a true Android experience, capable of playing, for example, the same graphically-intensive games as can currently be enjoyed on a standard Android slab. Check out the new video below, and be sure to leave your comments via the usual channels.